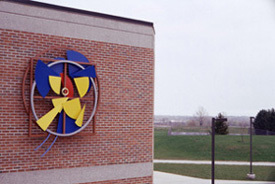 Created for the Health and Wellness Center at the University of Wisconsin, Parkside, the work connects the geometric artifacts of the early search for truth through geometry (sacred geometry) to kinesics or motion studies. East meets West on the two facing walls of the installation. The primary elements of Geometrica Kinesic lie in the symbolic representation of Eastern and Western reflections on "self" and "wellness". The Western wall features the "Geometrica" which is based upon the "squaring of the circle" from Sacred Geometry through to its natural Yin-Yang form. This element is surrounded by the classical geometric definition of the human. Starting with a derivation of DaVinci's canonical man, then the geometic definition of male and female, and then expanded to include figures in motion. 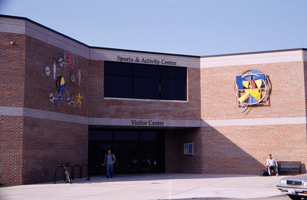 The geometric element of the East entry wall, the "Kinesic" is derived from the "motion sweeps" of the figures on the West wall superimposed over a similar geometic base. 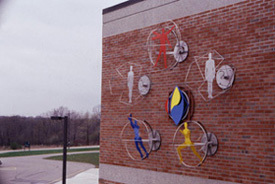 The colors of the geometric kinesic forms relate to the specific motions and figures on the West wall. 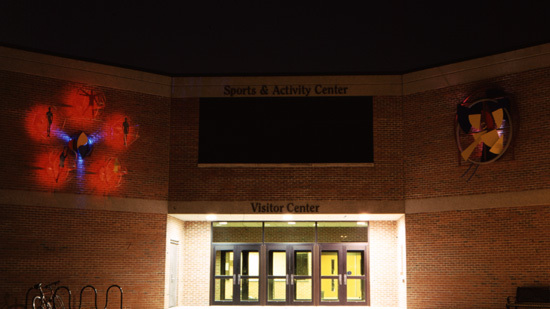 Materials: Adhered vinyl covered and powder coated formed and welded Aluminum sheet and tubing, Stainless Steel, Brass, Acrylic Plastics, High intensity LED arrays, Electric components. Throughout history humans have sought to correlate their figure to the divine geometry and the motions of human form to useful function. Ranging from the sacred Geometries to ergonomics the geometric description of the human form has always intrigued artists and designers. The historic translations of these concepts in the canonical drawings of da Vinci and Durer demonstrate this archetypical geometry as do the earlier images of the Paradigmatic and Cosmic Man. The manas (mind) or consciousness which can reflect upon itself. The work, Geometrica Kinesic, is our vision of this archetypical search for the relationship of man, motion, and geometry and our reflection upon ourselves. As a part of the method for defining the greater universe it was believed that the human form contained all of the sacred relationships developed through the geometric studies. The analytical canons of da Vinci and Durer both show the figure divided in half by the reproductive organs and by phi at the navel. Durer went on to further define the human figure by thirds, divisions of the square root, and divisions of Phi. 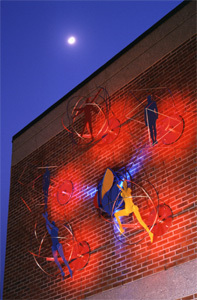 The Geometrica Figures of the west wall visualize this ancient relationship between human form and geometry (female as Dodecahedron and male as Icosahedron) and interpretive kinematics. Arranged on a hierarchal pentagon from DaVinci's canon, through the human base forms, to the motion studies, the gathering represents the mind, spirit, and body of man. The Kinesic is generated from the arcs of motion during various activities. In profile these arcs are superimposed over each other and Leonardo's range of motion. The grid and center circle show the divisions of half and phi from the canons with the motion minimalized as the forms of Archipenko. This motion interpretation was taken from both ergonomic studies and Muybridge sequences while showing a similar quality of motion to that of the futurist sculptor Boccioni. This work strives to balance the inseparable mind and body. The western side of the piece is demonstrative of the analytical approach to the definition of the universal through the tradition of geometric studies. The eastern side of the work views the holistic relationship between the universal and the body and the intertwined yin-yang philosophies. The objects themselves are derived from these concepts and their relationship to human and body. The Geometrica Figures are derived from the ancient golden proportions prominent in western art and their use to define the human form; while Kinesics is derived from the purity of motion and the seed of eastern symbolic dance.